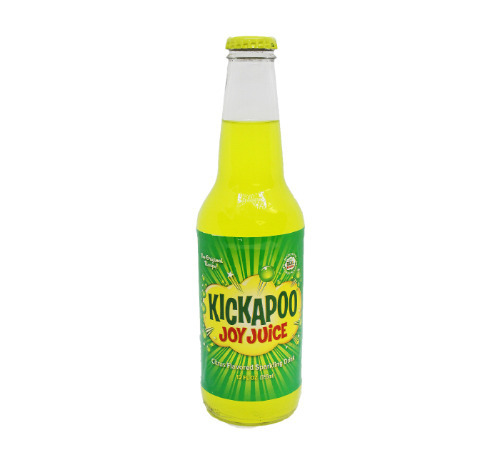 FRESH 12oz glass bottles Kickapoo Joy Juice with CANE SUGAR!!! The original dogpatch recipe. Very similar to Mountain Dew, but has actual grapefruit juice! Introduced in 1967 by the Monarch Company of Atlanta, Georgia, Kickapoo Joy Juice was one of those strange novelty flavors that saw only a limited regional success. The brand employed both Native American and prehistoric stereotypes Lonesome Polecat and Hairless Joe to sell the syrup as a valuable reminder of yesterday’s funny flavors and the whimsy of pop.